Albert Einstein (1879-1955) was the most famous physicist of the 20th century, who however self-described himself to be “more of a philosopher than a physicist”. [note 1] He was born in Ulm, in Württemberg, Germany in a Jewish family. During his stay at the Swiss Patent Office Einstein produced much of his remarkable work. In 1905 he obtained his doctor's degree. He won the Nobel Prize for his work on the photoelectric effect in 1921. Einstein immigrated to the United States in the late 1930s to take the position of Professor of Theoretical Physics at Princeton; upon the urging of a colleague in physics, recommended that President Franklin D. Roosevelt develop an atomic bomb project. He later regretted this and became a passionate pacifist. In 1952, he was offered the Presidency of Israel, but he turned it down. Einstein collaborated with Dr. Chaim Weizmann in establishing the Hebrew University of Jerusalem. Albert Einstein died on April 18, 1955 at Princeton, New Jersey at the age of 76. In 1898, young Albert Einstein applied for admission to the Munich Technical Institute and was turned down. The young man, the Institute declared, "showed no promise" as a student. By 1905, he published his explanation of the special theory of relativity. Einstein contributed to the theory of a Special Relativity and the theory of General Relativity. He also contributed to the study of photoelectric effect, Brownian Motion and Bose-Einstein Statistics. He was critical of quantum mechanics and has proposed the EPR-Paradox in attempt to point out spooky aspects of the theory. The last fifteen years of his life were spent in unsuccessfully searching for a Unified Field Theory. Einstein's best-known scientific work is his 1905 papers on Special Relativity. Einstein did not cite any references and it was widely and falsely assumed that his work was original. The theory of relativity had already been published by Hendrik Lorentz and Henri Poincaré. Einstein's contribution was to give a description of the Lorentz-Poincaré theory without reference to the luminiferous aether and to clarify some of the physical consequences of the theory. He used the term "stationary system" instead of the term aether. Einstein then wrote a series of papers applying relativity to gravity using the mathematics of Riemannian Geometry, contributing to General Relativity. Much of the actual mathematics of general relativity was worked out by Marcel Grossman, David Hilbert, and others. Einstein's main contribution was to give an alternate derivation of the field equations, and to apply them to explain an anomaly in the advance of the perihelion in Mercury's orbit. Arthur Eddington popularized General Relativity by publishing an explanation of it and by attempting to prove the theory experimentally in a dramatic test. Eddington embarked on a highly publicized trip into the Atlantic Ocean off Africa in order to observe the bending of starlight passing nearby the Sun during the total solar eclipse of May 29, 1919. Eddington returned with a declaration that he had proven Einstein's theory of General Relativity, making Einstein extremely famous, when in fact he had selectively used data to attain this result. No Nobel Prize was given for relativity. In April 2004, NASA launched the satellite "Gravity Probe B" to test the geodetic precession and frame dragging effects of general relativity. The successful result of this test was announced on May 4, 2011. Einstein compared the effects of large objects on space and time to the way that a large ball placed on a sheet of rubber stretches the material and causes it to sag, and drew the analogy with the way stars and planets warp space-time. A smaller ball rolling along the sagging fabric will be drawn towards the larger ball, in the same way that the Earth is drawn towards the sun, but will not fall into it as long as it continues to move at sufficient speed. This was a change in thinking from the Newtonian cosmos, in which gravity was viewed purely as an attractive force between bodies. Einstein's statistical explanation of Brownian motion (the random movement of microscopic particles mixed in with pollen) is sometimes credited with helping to confirm the atomic theory at a time when some scientists argued against it. Most scientists had accepted atomic theory a century earlier. Einstein also published a heuristic explanation of the photoelectric effect in which light has particle-like properties as well as wave-like properties. According to Maxwell's Equations, light is a wave, so one might expect that increasing the intensity of light should increase the number of electrons emitted from metal. The German physicist Lénard did an experiment proving that this was not true. Einstein argued that the experiment was consistent with Max Planck's hypothesis that light is quantized and different particles of light or photons have different frequencies. Therefore, increasing the intensity of low frequency photons has no effect, while using a higher (blue or ultra violet) frequency of light does cause more electrons to be emitted. The formula Einstein used to explain this was Planck's formula e = hf, where h is Planck's constant and f is the frequency. Although Einstein won a Nobel Prize for explaining the photoelectric effect, Lénard was critical of his accomplishments. Planck and Lénard had already received Nobel Prizes for related work explaining the photoelectric effect. Einstein also recognized the value in work done by the physicist Satyendra Nath Bose when others did not, and helped Bose publish what is now referred to as Bose-Einstein statistics. A simplified explanation is that the statistics for bosons (including light) are different from the statistics for fermions which make up solid matter in that there is no way to tag or differentiate one boson from another for statistical comparisons. Einstein's famous formula E = mc2 says that mass and energy can turn into each other. It was first published by Henri Poincaré. Einstein published an alternate derivation that was corrected and improved by Max Planck. E stands for energy, m is mass, and c is the speed of light. So, if you increase the energy of a substance, for example by heating it, it gains a minute amount of mass. It was later realized that if you split an atom apart, as in a nuclear explosion, it loses a tiny amount of mass that is released in the form of energy. The connection E = mc2 to nuclear energy is not as direct as pop culture sometimes represents. Einstein did not discover the huge energy available from nuclear reactions. Early workers in radioactivity, such as Ernest Rutherford, understood clearly that the natural radioactive decay of radium released quantities of energy that could not be explained by chemistry, and were much larger than those of chemical reactions. Neither did Einstein originate the key idea that made nuclear energy a possible weapon or a practical energy source. That was Leo Szilard, who acknowledged having been inspired by a 1914 H. G. Wells novel. Szilard discovered or invented the chain reaction (and patented it). However, other people recognized the relation between Einstein's interpretation of the E = mc2 formula and chain reactions. Einstein explained that matter releasing energy is also losing mass. Energy binds together the parts of an atom, including the nucleus. The nucleus of an atom is tiny, but very little mass could release a huge amount of energy. When one nucleus splits apart, it splits other nuclei around it. This is called a chain reaction. For a more detailed treatment, see Cosmological constant. Einstein revised his work on General Relativity to include a 'fudge-factor' which he termed the "cosmological constant". He was trying to account for the apparent steady-state nature of the universe. One doesn't need to understand relativity to get a rough idea of the problem. Suppose the universe consists of a number of galaxies scattered about, and that they have been scattered about in this way forever. Gravity would make them attract each other, and they would very slowly move toward each other. That is, they would "fall". The speed of this would be extremely tiny, but if the universe were truly eternal, that is, it had been this way forever, they wouldn't still be scattered. What is needed is a fudge factor saying that there is a tiny gravitational repulsion to go along with the much larger and better-known inverse-square attraction. The repulsion force would be extremely tiny because the galaxies are far away, but it would have to be there. In the general relativity formulation of gravity, this takes the form of the cosmological constant appearing in the field equations of GR. Edwin Hubble (after whom NASA's famous Hubble Space Telescope is named) later convinced him otherwise. At one point he had Einstein actually making direct observations alongside him, and Hubble's findings showed conclusively that the universe was indeed expanding, as predicted by certain solutions of GR's field equations in the absence of a cosmological constant. Einstein recanted his original position, and accepted as true the notion of a changing universe having a definite beginning. He later said of his Cosmological Constant, "It was the biggest blunder of my life." An interesting end-note on this term: Principal investigators from Princeton University first published findings in 1998 apparently revealing an accelerating expansion for the universe. Because this initially seemed like it might be a sort of 'anti-gravity' effect (similar in concept to Einstein's original notion), it briefly became quite popular for scientists to dub the phenomenon the 'Cosmological constant' as well. For more information, see: Dark Energy. ...the daily effort comes from no deliberate intention or program, but straight from the heart. Einstein received honorary doctorate degrees in science, medicine and philosophy from many American and European universities. He won the Nobel Prize in 1921 for his work on the photoelectric effect. He gained the Copley Medal of the Royal Society of London in 1925 and the Franklin Medal of the Franklin Institute in 1935. Einstein was offered the presidency of Israel in 1952  but respectfully declined, stating he believed his lifelong study of objective matters made him an inappropriate candidate for a position in politics; he was also strongly opposed to nationalism. In 1999, he was named "Person of the Century" by Time magazine. In 1939 research done by several leading scientists including Enrico Fermi regarding chain reactions of nuclear fission prompted Leo Szilard to persuade Einstein to write a letter to President Roosevelt, to warn the President about the possibility of nuclear weapons and that Nazi Germany had already taken an interest in this technology. Einstein himself had never been involved in the Manhattan project. He was considered a security risk, as he was a member, sponsor, or affiliated with thirty-four communist fronts between 1937 and 1954. Later he condemned the use of nuclear weapons. Dr. Thomas Stoltz Harvey, then a pathologist, performed the autopsy on Einstein in the Princeton Medical Center several hours after his death. Upon completion, Dr. Harvey removed the brain and eyes. There is controversy about whether or not Harvey had consent from the Einstein family to remove the brain and keep it, though letters from Otto Nathan, executor of the Einstein estate, suggest that Harvey did indeed have permission to keep the brain, as long as research performed on it was only described in scientific journals. The brain was photographed and sliced into 240 pieces in order to be preserved and further studied. Harvey hoped some uniqueness would be discovered that distinguished Einstein's brain as "genius". Although he sent pieces away for further study, the bulk of the brain remained with Harvey for over 40 years. His once-ambitious plans for doing research on Einstein's brain were never actualized, though there were at least two controversial studies performed which suggested a physical reason for Einstein's intelligence. In 1996 Harvey entrusted Elliot Krauss, chief pathologist at the Princeton Medical Center, with the brain. The brain now sits in a secret location, possibly only a few feet away from where it was first removed from Einstein's head. Krauss loans out pieces of the brain for scientific research, but he is very discriminating in deciding who shall receive a piece. Einstein wearing a kippah in a Berlin Synagogue, 1930. There is some controversy surrounding the religion of Albert Einstein. "[The fanatical atheists] are like slaves who are still feeling the weight of their chains which they have thrown off after hard struggle. They are creatures who—in their grudge against the traditional 'opium of the people' [Karl Marx's oft-cited description of religion]—cannot bear the music of the spheres." Taken as a whole, it appears Einstein rejected the literal stories of God's personal involvement with the Hebrews, but he did believe in the existence of a higher power as a metaphor for what we did not know about the universe. "I am neither a German citizen, nor is there in me anything that can be described as ‘Jewish faith.’ But I am happy to belong to the Jewish people, even if I do not consider them in any way God's elect." "I thank you, even at this late hour, for having made me conscious of the Jewish soul." Einstein willed that all his scholarly work be archived in Israel's Hebrew University after his death. "He who joyfully marches to rank and file, has already earned my contempt. He has been given a large brain by mistake, since for him the spinal cord would surely suffice. This disgrace to civilization should be done away with at once. Heroism on command, how violently I hate all this, how despicable and ignoble war is; I would rather be torn to shreds than be a part of so a base of action. It is my conviction that killing under the cloak of war is nothing but an act of murder." The Germans as an entire people are responsible for the mass murders and must be punished as a people if there is justice in the world and if the consciousness of collective responsibility in the nations is not to perish from the earth entirely. Behind the Nazi party stands the German people, who elected Hitler after he had in his book [Mein Kampf] and in his speeches made his shameful [genocidal] intentions clear beyond the possibility of misunderstanding. Many ideas and quotes are falsely attributed to Einstein. He did not invent very much of we now call special relativity. The Principle of Relativity, that the law of physics should be the same in all inertial frames, had already been published before Einstein. He did not discover the Lorentz transformation, or the Lorentz invariance of Maxwell's Equations for electromagnetism. He was not the first to propose that the speed of light is constant for all observers, or that "the aether" is superfluous and not observable. He was not the first to recognize and explain how special relativity causes an ambiguity in defining simultaneity. He did not combine space and time into a four-dimensional spacetime in his special relativity papers until others had been doing it for a couple of years. Einstein did not invent the term "relativity theory", and did not even like the term. He called it the "so-called relativity theory" until 1911. Einstein did not banish the ether from Physics. In a 1920 lecture, he said, "More careful reflection teaches us, however, that the special theory of relativity does not compel us to deny æther." Einstein was not the first to observe the equation E = mc2 as a consequence of special relativity, or to foresee its application to nuclear binding energies or antimatter annihilation. Einstein only published faulty and incomplete proofs. He did not foresee a nuclear chain reaction and had to be persuaded about the possibility of an atomic bomb. However, Einstein's interpretation of the E = mc2 equation was fairly popular. According to Einstein, a body losing energy through heat or radiation was losing mass. Einstein did not originate the idea of using non-Euclidean geometry metric tensors to reconcile gravity with special relativity. It was not his idea to describe gravity in covariant equations, and he published papers supposedly showing that it was impossible. He did not discover the Lagrangian formulation of general relativity, and was not the first to publish the field equations. He did not foresee the expansion of the universe (although this expansion is consistent with the field equations), the possibility of black holes, or dark energy. Einstein did not originate the idea that light is observable as particles. Max Planck published that a few years before Einstein, and received a Nobel prize for it. Einstein did not prove that matter was made of atoms. That had been known for a century when Einstein published his 1905 paper on Brownian motion. Einstein never developed a unified field theory of any significance. He published papers on quantum mechanics, but always insisted on a deterministic interpretation. Many quotes are falsely attributed to Einstein. Here are a few. "If the bee disappeared off the surface of the globe then man would only have four years of life left." "We use only 10% of our brains." "Evil is simply the absence of God." "Originality is the art of concealing your sources." Here are some quotes that have been attributed to Einstein, but which have not been verified. ↑ Richard Feynman observed that "The philosophers are always on the outside making stupid remarks." "The Nobel Prize in Physics, 1921" (2014). Nobelprize.org. Einstein, Albert (June 30, 1905). "On the electrodynamics of moving bodies". Translated in Perrett, Wilfred and Jeffery, George B. (1923), The Principle of Relativity: A Collection of Original Memoirs on the Special and General Theory of Relativity (London: Methuen), pp. 35–65. Translation of Das Relativatsprinzip (1922, Leipzig [Germany]: Teubner), 4th ed. Retrieved from Fourmilab [Switzerland] website. Einstein, Albert (September 27, 1905). "Does the inertia of a body depend on its energy-content?". Translated in Perrett, Wilfrid and Jeffery, George B. (1923), The Principle of Relativity (London: Methuen), pp. 67–71. Translation of Das Relativatsprinzip (1922, Leipzig [Germany]: Teubner), 4th ed. Retrieved from Fourmilab [Switzerland] website. Paterniti, Michael (2000). Driving Mr. Albert: A Trip Across America With Einstein's Brain (New York, NY: Random House). ↑ David Berlinski. "3. Horses do not fly", The Devil’s Delusion. Basic Books, New York, 2009, 58. ISBN 978-0-465-01937-3. ↑ "The Nobel Prize in Physics, 1921" (2014). Nobelprize.org. Retrieved on January 23, 2015. ↑ Einstein, Albert (August 2, 1939). "Letter to F. D. Roosevelt, President of the United States". www.dannen.com. Retrieved from "Leo Szilard Online: Einstein's Letter to Roosevelt, August 2, 1939" on January 23, 2015. 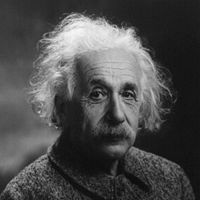 ↑ 6.0 6.1 6.2 "Albert Einstein anecdotes" (2003). Windsor Castle. Retrieved from December 5, 2003 archive at Internet Archive on January 23, 2015. ↑ Lightman, Alan (September 9, 1997). "Relativity and the cosmos". PBS.org/WGBH/Nova. Retrieved on January 24, 2015. "On November 8, 1919, for example, the London Times had an article headlined: 'The Revolution In Science/Einstein Versus Newton.' Two days later, The New York Times' headlines read: 'Lights All Askew In The Heavens/Men Of Science More Or Less Agog Over Results Of Eclipse Observations/Einstein Theory Triumphs.'" ↑ Cassidy, David (2004). "Einstein on Brownian motion". American Institute of Physics/AIP Center for History of Physics/Albert Einstein-Image and Impact/The Great Works I. Retrieved on January 24, 2014. ↑ Davis, Warren, PhD. (2008 or before). "What is the photoelectric effect?" PhysLink.com. Retrieved on January 24, 2015. ↑ Evans, Richard J. (2005). The Third Reich in Power (London: Penguin Books), pp. 306-309. ↑ "WMAP produces new results" (2013). NASA/Goddard Space Flight Center/Wilkinson Microwave Anisotropy Probe website. Retrieved on January 25, 2015. ↑ 20.0 20.1 Mallove, Eugene F., Sc. D. (July–August 2001). "The Einstein myths—of space, time and aether". Infinite Energy Magazine, iss. 38. Retrieved from Infinite Energy website on January 25, 2015. ↑ Küpper, Hans-Josef (2004 or bef.). "President of the State of Israel". Albert Einstein in the world wide web. Retrieved on January 25, 2015. ↑ Einstein, Albert (August 2, 1939). "Letter to F. D. Roosevelt, President of the United States". Hypertextbook/E-World. Retrieved on January 25, 2015. ↑ "Albert Einstein" (2004). Federal Bureau of Investigation website. Retrieved from August 10, 2004 archive at Internet Archive on January 25, 2015. ↑ "The long strange journey of Einstein's brain" (April 18, 2005). Review and excerpt from Burrell, Brian (2005), Postcards from the Brain Museum. National Public Radio website. Retrieved on January 25, 2015. ↑ Abraham, Carolyn (2001). Possessing Genius (U.K.: Icon Books), 2005 edition. ↑ Isaacson, Walter (April 27, 2007). "Einstein and the mind of God". Washington Post. ↑ 27.0 27.1 Jammer, Max (1999). Einstein and Religion (Princeton, NJ: Princeton University Press). ↑ Et Cetera (1943), p. 61. Retrieved from GoogleBooks archive on January 26, 2015. ↑ Isaacson, Walter (2007). Einstein: His Life and Universe (New York, NY: Simon and Schuster), p. 390. Retrieved from GoogleBooks archive on January 26, 2015. ↑ Einstein, Albert (January 3, 1954). Excerpt of "Letter to Eric Gutkind". Excerpt retrieved from Randerson, James (May 13, 2008), "Childish superstition: Einstein's letter makes view of religion relatively clear", Theguardian website [U.K.] on January 28, 2015. ↑ Einstein, Albert (March 24, 1954). Letter from Albert Einstein - The Human Side (1979), selected and edited by Dukas, Helen and Hoffman, Banesh (Princeton, NJ: Princeton University Press). ↑ Logunov, A. A. (2005). Henry Poincaré and Relativity Theory. Retrieved from Cornell University arXiv.org archive on January 28, 2015. ↑ Macrossan, Michael N. (1986) "A note on relativity before Einstein". British Journal for the Philosophy of Science, vol. 37, no. 2:, pp. 232-234. Retrieved from University of Queensland [Australia]/UQ eSpace archive on January 28, 2015. ↑ Rothman, Tony (March–April 2006). "Lost in Einstein's shadow". American Scientist, vol. 94, no. 2, p. 112. Retrieved on January 28, 2015. ↑ Fric, Jacques (June 2003). "Henri Poincaré: A decisive contribution to Special Relativity, the short story". www.everythingimportant.org. Retrieved on January 28, 2015. ↑ Quoted in Tipler, Frank J., astrophysicist of Tulane University (October 26, 2008). "The Obama-Tribe 'Curvature of constitutional space' paper is crackpot physics". Social Science Research Network website. Retrieved on January 31, 2015. ↑ Henri Poincaré published it in 1900. Hermann, Robert A. (January 1, 2004). "E = mc2 is not Einstein's discovery". Retrieved from December 17, 2008 archive at Internet Archive on January 24, 2015. Ohanian, Hans C. (September 2008). Einstein's Mistakes: The Human Failings of Genius. Retrieved on January 31, 2015. "Einstein's 23 biggest mistakes" (September 1, 2008). Discover magazine website. Retrieved on January 31, 2015. Einstein, Albert (September 27, 1905). "Ist die Trägheit eines Körpers von dessen Energieinhalt abhängig? ", Annalen der Physik, vol. 18, pp. 639–643. Retrieved from December 17, 2008 Internet Archive archive of University of Augsburg/Annalen der Physik website on January 31, 2015. English translation: Einstein, Albert (September 27, 1905). Hypertext of "Does the inertia of a body depend on its energy-content?". Translated in Perrett, Wilfrid and Jeffery, George B. (1923), The Principle of Relativity (London: Methuen), pp. 67-71. Hypertext retrieved from Fourmilab [Switzerland] website on January 31, 2015. ↑ His friend Paul Ehrenfest pointed out the need for curved space. Kaku, Michio (2014). "Albert Einstein". Encyclopedia Britannica. Retrieved on February 1, 2015. ↑ Walter, Scott (2006). "Breaking in the 4-vectors: the four-dimensional movement in gravitation, 1905–1910". University of Nancy 2 [France]/Department of Philosophy/Scott Walter website. Retrieved from December 5, 2006 archive at Internet Archive on February 1, 2015. ↑ Norton, John D. (March 1993). "General covariance and the foundation of general relativity: eight decades of dispute". Reports on Progress in Physics, no. 56, pp. 791-858. Retrieved from University of Pittsburgh/John D. Norton website on February 2, 2015. ↑ Applewhite, Ashton, et al. (2003). And I Quote: The Definitive Collection of Quotes, Sayings, and Jokes for the Contemporary Speechmaker (New York: St. Martin's), rev. ed., p. 146. Retrieved from GoogleBooks on February 2, 2015. ↑ Darbellay, Frédéric et al. (2008). A Vision of Transdisciplinarity: Laying Foundations for a World Knowledge Dialogue (Boca Raton, FL: CRC Press), p. xix. Retrived from GoogleBooks on February 2, 2015. ↑ Feld, Bernard T. (1979). "Einstein and the Politics of Nuclear Weapons". Albert Einstein: Historical and Cultural Perspectives: The Centennial (1982), edited by Holton, Gerald James and Elkana, Yehuda (Princeton, NJ: Princeton University Press), p. 388. Retrieved from GoogleBooks on February 3, 2015. This page was last modified on 15 April 2019, at 00:08. This page has been accessed 162,111 times.